Petit White Dolphin private cruise 3 days 2 nights is the best choice for an unforgettable holiday! 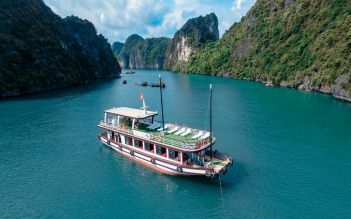 Spectacular views of Halong Bay and Bai Tu Long bay along the journey with various interesting travel experiences will never fail to impress your and your beloved. One of the most attractive destinations is Vung Vieng floating village - a peaceful and typical fishing village. With various activities around, you can freely discover many interesting things not only from this village but also from surrounding area. 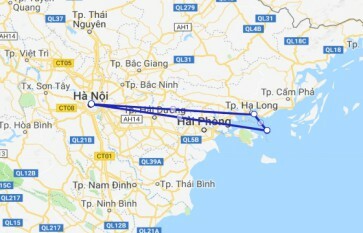 07h30: Pick up from your hotel in Hanoi. Drive to Halong City through the green fields in the Red River Delta. We really enjoyed our time on this very special boat. I don't normally stay in hotels as fancy as this boat. Our room was half the bottom level of the boat. It has two queen size beds, a sitting area and a bathroom complete with a spa bath. The whole side of the room is windows so you can lie in bed and enjoy the wonderful view. May was an amazing host and took us to see a cave and a floating villiage. We got to use kayaks and for one of the dinners were were shown how to roll spring rolls. We had a great time on the Petit White dolphin. Smooth pick up and drop off in a comfortable mini bus with good air conditioning. The Petit White dolphin itself is very well presented and clean. The rooms are beautiful with large bathrooms, comfy beds and again great air con. Plenty of sun loungers and chairs on the deck, plus a bar and restaurant inside. All staff are very polite and friendly, great service with a smile and nothing is too much trouble. Food was great, and so much of it too. Drinks are a little pricey, would advise taking your own drinking water. We enjoyed all the little excursions and you get plenty of time for swimming and kayaking. Just wish we got to say a proper good bye, but thanks again guys we had a great time!! Good cruise with a not to big ammount of people on a great looking JuNk (boat) we had lovely activities, like making springrolls, fishing, kayaking, swimming, boattour, all great and not to long or to short. Only con for us was the guide, who didnt speak English very well and therefore had a hard time answering questions or preferences. But in the end all went well and everybody had a blast!! The boat is quite run down and could do with some touch ups. The cabin is quite small, bed very hard but the shower was good! Staff are nice enough, although other than the 'guide' Nam, the others don't speak much English. Nam seems to be the only White Dolphin guide so he rotates between the 3 White Dolphin boats depending on demand (ie how many guests on that boat). So for us, we only saw him on day 3, when we were heading back to land. It would have been good to have someone who could speak English the whole time. Food was very average. Yes there was lots of variety but 80% of the dishes were deep fried. This was the most deep fried food we'd had in all of Vietnam. We had to ask that on the second night, there not be so much deep fried food - only then did we get more variety (although some dishes on the second night were the same as the first). When doing the 3D2N option, on the second day, guests are taken to a 'day boat' operated by a third party where you join people from other boats doing a 3 day trip. This is so the 'big boat' can go back to shore to drop off passengers and pick up new people. I'm not sure whether all boats operate like this - it is quite likely! The day boat was nice and had a chatty guide who spoke good English (also called Nam). The food on this day boat was much better than the White Dolphin. Activities on day 2 (on the day boat) included kayaking, watching a local fisherman catch fish and visiting an oyster farm. Overall, the cruise was OK and scenery very nice. Petit White Dolphin has 8 passengers max so it is more relaxed/cosy, but we felt 1 night was probably sufficient. Activities after around 3/4pm are exactly the same each day - kayaking around the same island, the same cooking class making spring rolls and squid fishing. In fact on night 2, we were told about the squid fishing but the staff were nowhere to be seen after dinner so the new passengers couldn't try that out! Awesome trip. The view was beautiful and the staff was very friendly and helpful and gave their best to make the trip as comfortable as possible. The food was amazing and the kayaking is a must. The trip was definitely worth the money.